Below are 5 different ways to play the E chord on guitar. Once you’ve mastered some of the basic chords on guitar it’s a great idea to learn different chords – like 7th chords, sus4 chords etc. But there’s another way you can expand your repertoire – and that’s by learning how to play the same chords but in different ways, in different positions on the fingerboard. 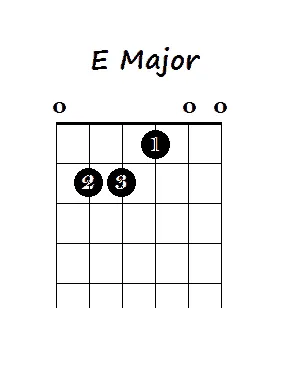 For clarification, when I say E, I mean E major. The first 2 variations below are quite common and you probably already know them. The other 3 you may or may not know how to play. They will give you options to play this chord in a less common way, which can add color and variation to songs you play or write. This is the most used and most known of all the E chords (with variation 2 a close second). All strings are strummed when playing this as a strummed chord. Some people play this using their 2nd, 3rd & 4th fingers instead but this is the most common way and it can allow freedom for your 4th finger (pinky) to do other things with the chord. 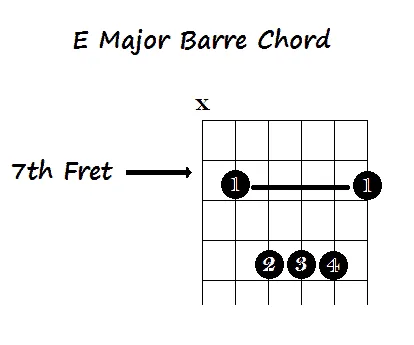 The Barre E chord is played by barring the 7th fret and creating the open A shape in the 9th fret. All the strings except for the Low E are strummed when strumming this chord. This way of playing E is also very common. How you create the A shape is up to you. Personally, I find it difficult to fit all 3 of my fingers into the 9th fret so I make that A shape by barring the D, G, & B strings in the 9th fret with my 3rd finger (ring finger). Alternatively, you can play this by barring the 12 fret and making an open E shape in the 13th and 14th frets – this is essentially the same chord but it can be difficult to get your fingers in the right place if you don’t have a cutaway on your guitar. 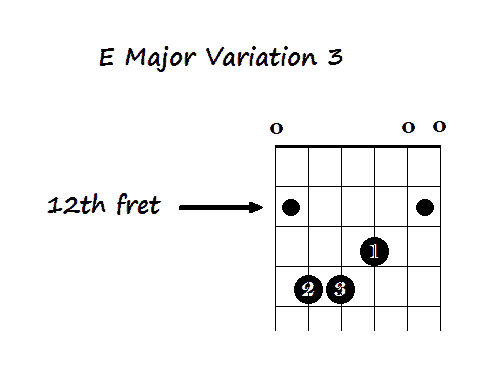 The 3rd variation is a simple addition to standard open E chord and can add color and sometimes might be more suited to a piece of music or offer a nice alternative. Or if you are jamming it can be a good one to play if you don’t want to move back to the first fret. It’s that easy but it has a very different character to the standard open E. This is essentially playing the same shape but starting in the 13th fret instead of the 1st fret. 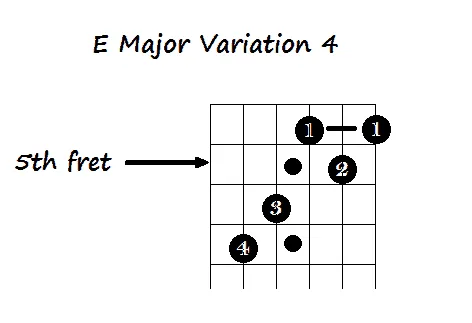 You can add other variations to this variation by playing the E shape with your 2nd, 3rd & 4th fingers and using your first finger in either the 12th fret of the Low E or the 12th fret of the high E string. Though I personally don’t find it that comfortable playing this chord with my 1st finger on the high E 12th fret – but everyone is different. This a good mid fingerboard option. And there are a couple of different variations within this variation. You can either strum this (not playing the Low E) or miss out the D string and pluck the A string with your thumb and pluck the G, B and E strings with the 1st, 2nd and 3rd fingers of your right hand (or left hand if left handed). Or you could strum it and include the Low E string. To add a different flavor you could also play this with an open Low E and open High E. This would be played. You could either play this by strumming all the strings or by just using the high E or just the Low E – or even leaving out both the high and low Es. Finally let’s take a look at an E that’s in between the 3rd and 4th variation above – in terms of location on the fingerboard. If strumming, you can strum all the strings or leave out the Low E.
And play the high E open. 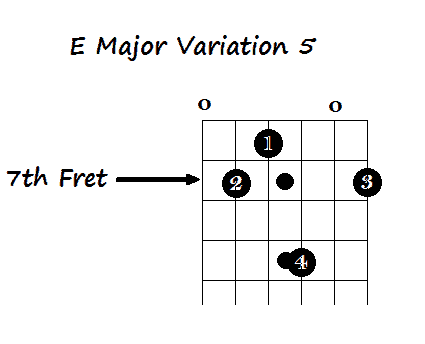 I hope this post has given you some new options for playing the E major chord. Are there any other ways that you like to play E. If there are any other ways you like to play it, feel free to leave a comment below.